MAY 2018 – ONE GREAT WEEK of B-17’s! All information is only published as the best of what we have heard or learned as media from credible sources about the coming events in May 2018. 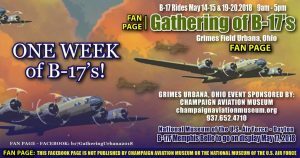 The Gathering of B-17’s: Urbana May 2018 FACEBOOK page is for FANS and not published by the Champaign Aviation Museum or U.S. Air Force Museum. The B-17F Memphis BelleTM will be placed on permanent public display on Thursday, May 17, 2018, with celebratory events on May 17-19, 2018 at the National Museum of the U.S. Air Force.